Revised plans for the development of New Street Station seem set to be approved this week. Changes to the £600 million development include alterations to the stainless steel cladding covering the multi-storey car park and amendments to the access ramps which planning officers say will improve the station&apos;s appearance. The proposals have been recommended for approval when Birmingham&apos;s planning committee meets on Thursday. Network Rail last month withdrew a proposal to keep the Navigation Street footbridge following widespread criticism that it would compromise the iconic design. They wanted to remove the cladding, saying the bridge could not sustain the weight without considerable strengthening works. Instead, it was proposed to give the grubby bridge a clean but, following talks with planning officials, this idea was scrapped and removed from the planning application. Now a design panel, including council planning experts, will consider new proposals for the footbridge. Planning officer David Wells, in a report to committee, said: "In the event that Network Rail propose future changes to the Navigation Street footbridge and entrances, they have agreed to an independent design review and would seek to involve the city council in selecting a suitable design panel." On the remainder of the changes, he adds: "The revisions to the Hill Street car park ramp are a significant improvement on the scheme as originally submitted and retain the integrity of the design." 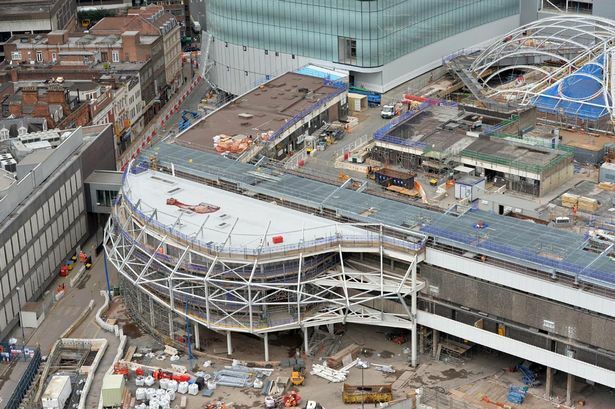 The completed station and Grand Central shopping centre will open in September 2015. This week on the free Birmingham Post app: First World War centenary special, interview with Hollywood star Vin Diesel and how Tolkien novel nearly went unpublished as well as daily breaking news. Download it here.